Item # 309705 Stash Points: 1,395 (?) This is the number of points you get in The Zumiez Stash for purchasing this item. Stash points are redeemable for exclusive rewards only available to Zumiez Stash members. To redeem your points check out the rewards catalog on thestash.zumiez.com. Showcase your love for the herb with HUF's Plant life Green Buddies 2 Yellow Crew Socks. Made with a plush, cushioned fit and feel, the Green Buddies 2 socks are impeccably comfortable and are designed with an all over green weed leaf monsters and logo script print pattern for an eye-catching look. 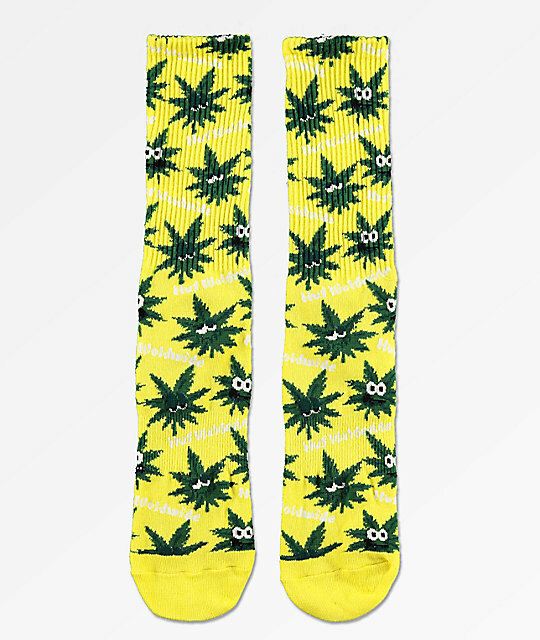 Plantlife Green Buddies 2 Yellow Crew Socks from HUF. Jacquard knit green weed leaf monsters and logo script print pattern throughout.